For the first time, scientists have resolved the detailed structure of the core region where magnetic reconnection takes place in the magnetosphere of Earth using unprecedented wave measurements. The study, based on data from ESA's Cluster mission, has mapped different types of electrostatic waves in this region. The waves trace populations of plasma particles that are involved in the different stages of a magnetic reconnection event. In most cosmic environments, matter is not made up of neutral atoms and molecules, but rather of electrically charged particles and ions. This ionised state of matter, called plasma, is permeated by electric and magnetic fields caused by local inhomogeneities in the distribution of particles and ions. These fields in turn influence the dynamics of the plasma on larger scales, so the distribution of the particles, ions, and fields changes constantly. Waves play an important role in the transfer of mass and energy across different plasma layers. Various types of waves develop during magnetic reconnection and tracing these waves through in situ measurements in Earth's magnetosphere is a unique way to investigate the reconnection process. Scientists have now used data from ESA's Cluster mission to characterise electrostatic waves in the tail of the magnetosphere and to 'see' into the heart of a magnetic reconnection region. "Most of the action during a magnetic reconnection event takes place at the thin boundaries that separate different layers of plasma. For the first time, we were able to see through this thin boundary and identify the different types of waves that arise there," says Henrik Viberg from the Swedish Institute of Space Physics in Uppsala, Sweden. Viberg is a PhD student at Uppsala University and lead author of the paper, published in Geophysical Research Letters, reporting the new findings based on data from Cluster. 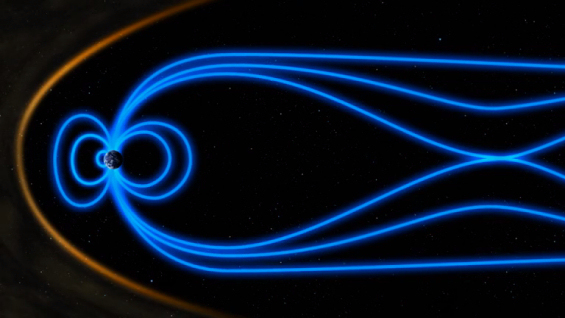 The magnetic reconnection region in the tail of Earth's magnetosphere. Viberg and his colleagues searched through the vast data archive of the Cluster mission for an event during which the spacecraft crossed the separatrix region during magnetic reconnection, and during which they were collecting data with the Wide Band Data (WBD) instrument. By making high-resolution measurements of the electric and magnetic fields, WBD allows scientists to probe the structure of the plasma through waves, rather than particles. Although they found only one suitable event in the archive, the spacecraft had crossed the transition between inflow and outflow regions several times during this event, providing enough statistics for a robust investigation. "Since electrostatic waves are a local phenomenon and don't propagate over long distances, they allow us to look very closely into the magnetic reconnection region," explains Yuri Khotyaintsev, Viberg's supervisor at the Swedish Institute of Space Physics. "The Cluster spacecraft detected waves only in the separatrix region – not in the inflowing or outflowing plasma – confirming our earlier suspicions. But there's more, because we have also resolved, for the first time, the structure of this region, as the spacecraft saw different types of electrostatic waves while flying across the separatrix." "If we drew a parallel with sound waves, we could associate Langmuir waves with the high-pitched sound produced by a violin, while Electron-Cyclotron waves would be closer to the lower-pitched music from a cello," comments Khotyaintsev. "The Electrostatic Solitary Waves would be more like the sound of maracas, consisting of short, individual pulses based on more than one pitch." This study provides the first detailed mapping of the types of waves found throughout the magnetic reconnection region and the first detection of Electron-Cyclotron waves in such a region. Resolving the structure of the separatrix region allows scientists to investigate the mechanisms underlying magnetic reconnection. Since different types of waves are produced by particles with different properties, the scientists analysed the correlation between the populations of particles detected in conjunction with the various types of waves. "We find high-energy electrons along with Langmuir waves: this is consistent with what we believe to be the origin of these waves, which can be generated by beams of high-energy electrons emerging from the X-shaped reconnection region. We detected Electron-Cyclotron waves in the same region, but we were not able to identify the mechanism that generates them," says Viberg. "Closer to the outflowing jets, the beam of high-energy electrons becomes more intense and flows of low-energy electrons streaming against the beam are also found here. This counter-streaming distribution is known to give rise to instabilities and, eventually, to Electrostatic Solitary Waves – which are exactly the waves we find in these regions," he adds. In future studies, the scientists plan to investigate if and how these electrostatic waves, which are confined to the magnetic reconnection region, might produce electromagnetic waves, able to propagate over much longer distances. This would allow a comparison between Earth's magnetic environment and the many different sites where magnetic reconnection occurs, ranging from the corona of the Sun, to the accretion discs around forming stars, to plasma created in the laboratory. "Working at the peak of its instrumental capabilities, Cluster has mapped what goes on at the core of the magnetic reconnection region. This provides an important insight into this fundamental process that takes place in plasma all across the Universe," concludes Matt Taylor, Cluster Project Scientist at ESA. The study presented here is based on data gathered by three of the four Cluster spacecraft (C1, C3 and C4) on 10 September 2001 as they crossed a magnetic reconnection region in the magnetotail of Earth's magnetic environment. Cluster is a constellation of four spacecraft flying in formation around Earth. It is the first space mission to be able to study, in three dimensions, the natural physical processes occurring within and near Earth's magnetosphere. Launched in 2000, it is composed of four identical spacecraft orbiting the Earth in a pyramidal configuration, along a nominal polar orbit of 4 × 19.6 Earth radii (1 Earth radius = 6380 km). Cluster's payload consists of state-of-the-art plasma instrumentation to measure electric and magnetic fields over a wide frequency range, and key physical parameters characterizing electrons and ions from energies of nearly 0 eV to a few MeV. The science operations are coordinated by the Joint Science Operations Centre (JSOC), at the Rutherford Appleton Laboratory, United Kingdom, and implemented by ESA's European Space Operations Centre (ESOC), in Darmstadt, Germany.